Now a days more and more families prefer modular kitchens as it helps them to design / plan the Kitchen as per their convenience and more effectively. Hence this type is gaining more popularity. We “Omkar Udyog” offer the following types of Modular Kitchens. These are regularly used shapes and further customization can be done as per customer requirements. This is to ensure effective utilization of kitchen area & revolves around the 3 basic functions of Cooking Serving and Washing carried out in the Kitchen. The kitchen auxiliaries play a major part in work space management. This space management helps to use kitchen area more efficiently. Our designers work on various aspects like frequently used tools, positioning of kitchen appliances w.r.t. sink and other space utilization techniques. Kitchen needs to be clean & hygienic. For that matter we manufacture user-friendly fabricated parts. Cockroaches and other pests are the most irritating element in the kitchen. 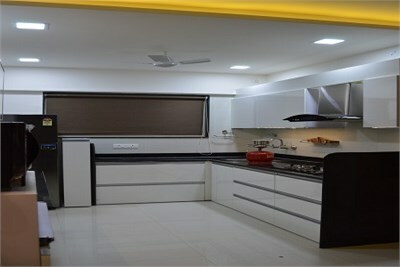 We do not claim, making cockroach free Kitchens but our designers do take precautions in the design stage to ensure that cleaning is easy and leads to minimization of pests. We can only take precautions to avoid cockroaches. We try to provide proper air ventilation grooves for the kitchen trolley, which will reduce moist condition inside the trolley.